Bergerac - The upriver neighbour to BordeauxThe Bergerac region is picturesque and historic with bastides (walled towns), medieval cities, chateaux, Romanesque churches and abbeys and gorgeous stone villages full of character and history and some exciting wines. Situated on the Dordogne River the town of Bergerac is about 50 km east of Bordeaux. Bergerac has a climate similar to that of St Emilion and Pomerol. History, rather than geography has lead to the difference in perception between the wines of Bordeaux and Bergerac. The 100 years war changed the medieval wine trade. Vineyards upstream of Bordeaux, (Gaillac, Bergerac and Cahors) were under French control, while the English linked to Bordeaux since the reign of Elinor of Aquitane continued their relationship with Bordeaux. Bergerac, the neighbour and close cousin of Bordeaux produces similar blends without the price tag. The main grape varieties are those of Bordeaux: Cabernet Sauvignon, Merlot, Cabernet Franc, Semillon and Sauvignon Blanc. Cabernet Sauvignon and Merlot usually make lighter style wines that are elegant, supple with silky tannins and represent the “terroir” of the region. Bergerac Blanc will be a blend of Sauvignon Blanc and Semillon. It is usually crisp, aromatic and full of vitality, pale in colour with a fine finish. 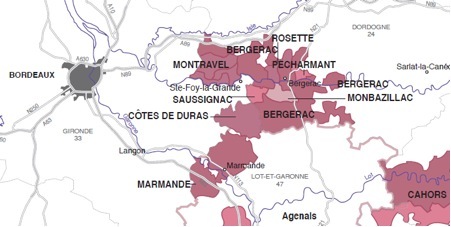 As with Bordeaux, Bergerac is not one simple appellation, but one broken into sub-sections according to slope, microclimate and soils; including Bergerac Rosé, Bergerac Rouge, Bergerac Blanc, Pecharmont, Saussignac Monbazillac, Montravel and Côtes de Bergerac. Luc de Conti is currently one of France’s leading white wine makers. He has been leading the movement to adopt organic viticultural practices in France. Chateau Tour des Gendres showcases both his viticultural and oenological skills. One of the loveliest wines from Chateau Tour des Gendres is the Bergerac Sec, Le Moulin des Dames Blanc, 2009. A fabulous complex and balanced Semillon/Sauvignon Blanc blend. Chateau La Rayre is situated in the gorgeous village of Colombier in the heart of Bergerac on the Dordogne. The Chateau La Rayre rosé could be one of the wines of the Aussie summer. A great wine to take to a BBQ or to the beach – it goes with just about anything! From renowned winemaker Christian Roche, the wines of Domaine de L’Ancienne Cure are made with passion, attention to quality and are considered amongst the best in the region. Pécharmont, a small appellation with the broader Bergerac region, is the oldest collective of vineyard in Bergearc. "Pécharmant" comes from the words "Pech" ( "Hill") and "Charmant" (Charming), thus meaning "the charming hill." Pécharmant vineyards are well exposed to the sun and the soil consists sand and gravel from the Périgord. The Domaine de L'Ancienne Cure Pecharmont Sélection, Rouge, 2008 has fine tannins, reflective of the sandy terroir, power without aggression, round and savoury.